Insert desiccants and oxygen absorbers in your bottles fast, easily and automatically with our versatile, affordable PS1 Packserter pouch desiccant inserter. Just roll it up next to any conveyor, load the roll of packets onto the spool, set the controls to fit your bottle and packing line and press start. 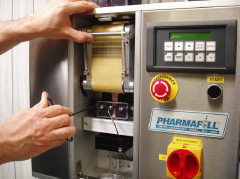 Our desiccant inserting machine automatically feeds the continuous strips of oxygen absorbers and desiccants, separates them into individual packets and inserts them into bottles with impressive precision at high speeds up to 100 packets per minute. Insert one packet per bottle or multiple packets per bottle. and other products where moisture, odor and other volatiles need to be addressed to keep the product dry and extend shelf life. With advanced PLC controls in a touch-pad interface, our automatic, inline desiccant inserting machine is easy to setup, easy to use and easy to adjust for different products. You can adjust our inserter based on the conveyor speed, packet feed roll speed, packet material thickness and other factors. We designed it to accommodate different material widths using only a small number of change parts for fast changeover that any line technician can do in a few minutes. We also mount our inserter on top of a variable height lift platform so the inserter height can be raised or lowered in seconds based on the bottle height without having to adjust the conveyor. You can also use our PS1 Packserter for packaging other types of pouches and packets like fast food condiments, sample-size lotions and personal care products and nearly anything in ¼ gram to 5-gram packets on a continuous strip spool. You can feel comfortable letting our PS1 Packserter sorbent inserter run unattended hour after hour. If the packet supply has ended or if no bottles are set under the exit tube then our inserter automatically detects the problem, raises an alert and stops the machine. It also automatically detects if a cut packet has blocked the exit tube or otherwise has not been properly loaded into the bottle and stops the machine. Along with emergency stops, machine safety guarding and other safety advances, we designed our PS1 for extra safe knife management. When adjustments to the blade or removal and replacement are needed over time, the blade may be removed with the complete cutting unit intact to prevent the need for contact with the blade.